An excellent general-purpose material, TIVAR­ 1000 (natural) is a cost-effective solution for food handling problems, and meets FDA, USDA and 3-A Dairy guidelines for food processing and handling. Mitsubishi Chemical Advanced Materials also offers custom colors compounded with FDA/USDA approved pigments, which meet FDA and USDA guidelines for food processing and handling. Whether your business is grain, pharmaceuticals, pizza dough or frozen poultry, TIVAR­ material will reliably move your materials and products. 48" x 96"sheets with gauge sizes ranging from 1/16" to 6"
48" x 120" sheets with gauge sizes ranging from 1/16" to 6"
60" x 120" with gauge sizes ranging from 3/8" to 1". 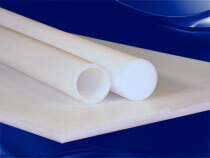 It is also available as extruded rod, board, tube, profiles and compression molded parts. All can be manufactured and colored to your exact specifications. With its built in dry lubricant and 80% COF reduction, TIVAR® HPV was developed specifically for use in today's most demanding production environments experiencing; high speeds, high temperatures, high friction,high loads and aggressive cleaning agents. TIVAR® HPV materials and finished parts offer reduced friction, near zero level "slip stick," and a LPV value 18-35% higher (more slick) than competitive materials. The superior sliding performance of Mitsubishi Chemical Advanced Materials TIVAR® HPV reduces friction of components against a mating partner while also better protecting parts from wear. Components made with TIVAR® HPV show improved sliding behavior and high wear and abrasion resistance at key touch points in conveyor systems. TIVAR® HPV is a cost-effective, FDA approved solution for preventing excessive wear and deformation of parts to support the longest possible lifecycle in conveyors, directly contributing to time in use and safety benefits. This grade, partially composed of reprocessed PE-UHMW material, has an overall lower property level than the virgin TIVAR 1000. Our TIVAR ECO grade shows a favorable price-performance ratio for applications in many kinds of industries with less demanding requirements. This PE-UHMW grade with extremely high degree of polymerisation contains a metal detectable additive with does hardly affect the inherent PE-UHMW key properties. TIVAR MD presents excellent toughness and impact strength, an even improved wear and abrasion resistance when compared with TIVAR 1000, and it also features a food contact compliant composition. TIVAR MD has been specifically tailored for use in the food processing and packaging industries where it can easily be traced by the conventional metal detection systems installed to detect contamination of the foodstuffs (results may vary depending on the sensitivity of the metal detection system used).